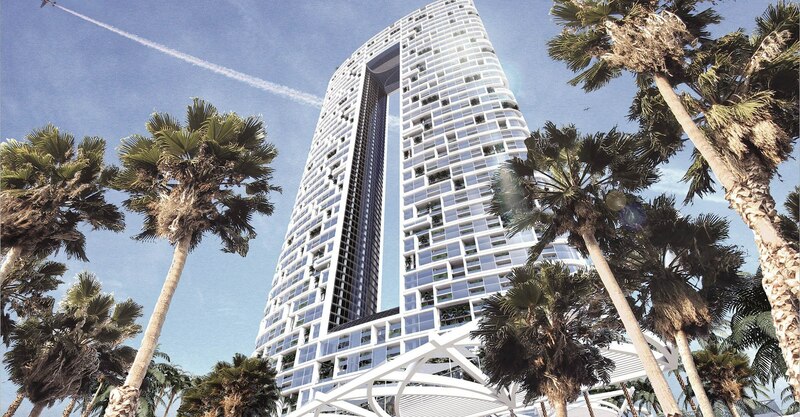 This high-rise building, located on the JBR beachfront, will house a five star hotel and serviced apartments. The 300+ meters high building is comprised of two twin towers connected at the top and bottom (with a large open void in the middle),fully clad with unitized curtain wall that incorporates aluminum bands. Podium levels, designed as terraces that step down towards the ocean, also have curtain wall and shading canopies. We developed the Façade and BMU design and will follow up with document review and site supervision until handover. Many different system are involved here: mainly unitized curtain wall, while stick system at balconies and on the podium facade, medal cladding on the void soffit and a glazed skylight. On the facade access side, two custom-designed machines - running around level 75- and a concealed lifting platform - fully concealed in the void soffit - allow for maintenance and cleaning all along the tower. Multiple systems - abseiling, gantries, manual cleaning - are implemented in the podium area.